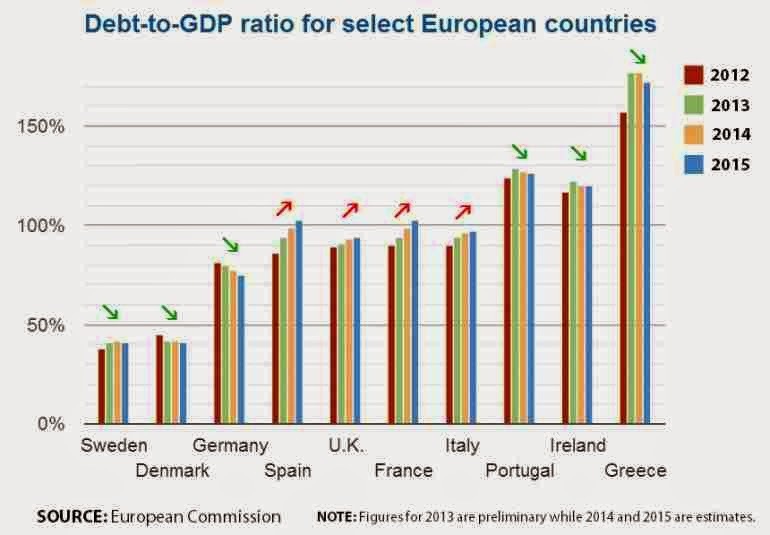 The most indebted, most fiscally irresponsible government in Europe, Greece has been hugging international news recently because of its huge public debt, and the huge bail out money given by many governments to it. This useful chart was sent by a friend, Luz. I think she got this from The Economist, am not sure. 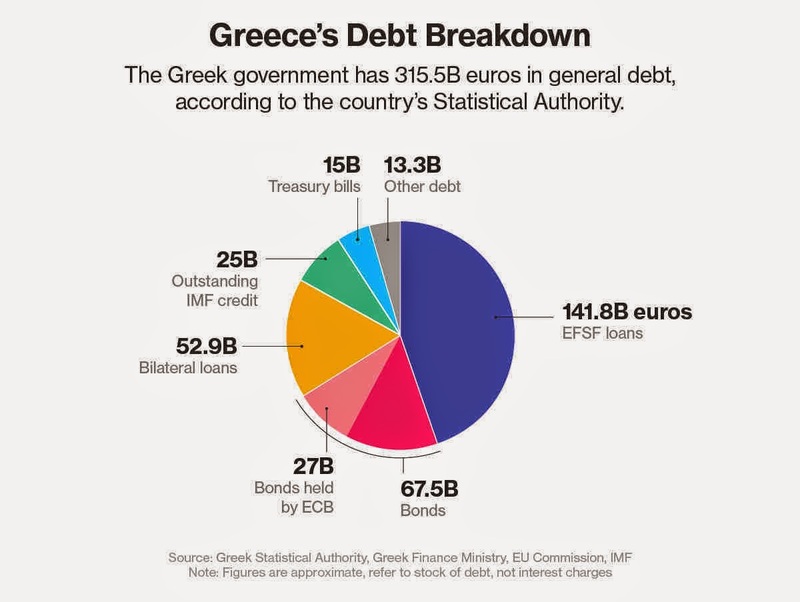 Three years ago, Greece's debt/GDP ratio was already above 150 percent. No sensible economy would dare touch that zone unless the bulk of such debt are domestic, like Japan's. Regional economic community (EC) and blocs like the ASEAN EC (AEC) can learn lessons from the case of Greece and the European EC (EEC) so that such mistakes should not be imitated and repeated. Subsidizing a spend-spend-spend, borrow-borrow-borrow economy to protect the regional currency and stability of the whole bloc creates huge moral hazards (dependency, entitlement mentality, related) problems. 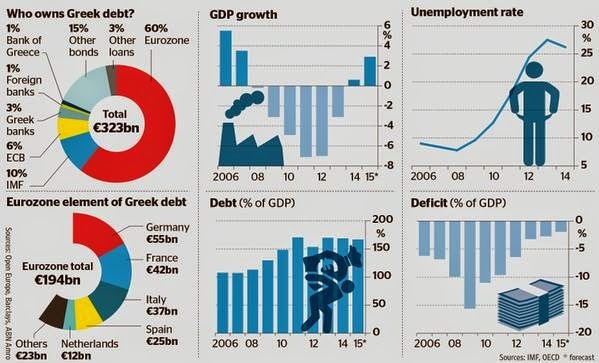 Why is Greece in this deep trouble"
Greece was living beyond its means even before it joined the euro. After it adopted the single currency, public spending soared. Public sector wages, for example, rose 50% between 1999 and 2007 - far faster than in most other eurozone countries. The government also ran up big debts paying for the 2004 Athens Olympics. And while money flowed out of the government's coffers, its income was hit by widespread tax evasion. So, after years of overspending, its budget deficit - the difference between spending and income - spiralled out of control. A populist, anti-austerity, socialist-leaning government won last month led by new PM Alexis Tsipras. He talked tough, suggesting that he would call for huge discounts in paying the public debt. 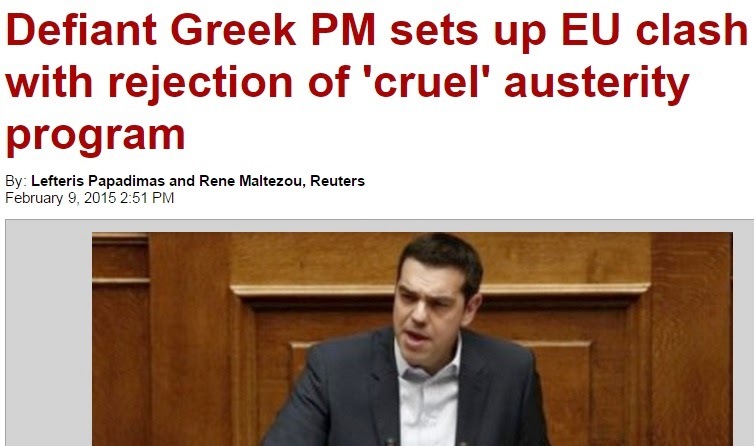 But the Finance Ministers of Germany, France, other huge EU lenders countered, "Greece must pay." The main problem here and in many other countries is government over-spending, living beyond its means, over-subsidies, over-welfarism and populism. For decades. Huge debt is nothing but accumulated wastes and profligacy. If previous spending financed by debt was productive, then the economy should be able to have a balance if not fiscal surplus, and pay back old debt. The big question of how to pay that mountain of debt is not so much addressed to the new Greek leadership, but the Greek people themselves. Is it too much to ask for huge public spending cuts, especially in subsidies and pension, if their government does not have the resources to sustain funding them? If they say Yes, then are they prepared to pay more taxes, more regulatory fees, more mandatory contributions, more fines and penalties? Most likely people will say No, or "Yes but tax only the super rich". But the very rich have many ways to adopt. Like negotiating their way out as they have access to the best law firms, accounting and PR firms. Or they can simply leave the country with their wealth. This already happened in France, when PM Hollande imposed the 75 percent income tax on people who earn 1 million Euro a year or more. Many super rich French businessmen surrendered their French passports and acquired new ones in Switzerland, Belgium, UK, Russia, etc. A highly welfarist and populist government invites lots of corruption. First, in corrupting the people's values, the culture of state dependency and entitlement thinking. Second. in corrupting politicians, legislators and the bureaucracy's values, that over-taxing other people is ok, it is fine, in the name of fighting inequality and pampering the culture of envy. Governments should shrink, spending, taxation and bureaucracies. The public must reclaim their bigger role in running their own lives, and the finances to sustain their own lives, their households and communities.